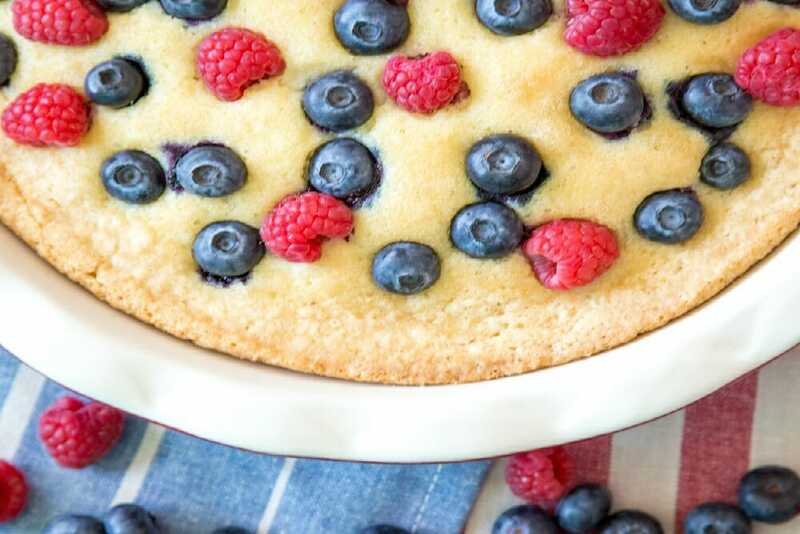 This Berry Buttermilk Cake is the perfect dessert all summer long ? not just on red, white & blue holidays. Preheat oven to 350 F (180 C). Butter a 10-inch (25 cm) pie or tart pan, or prepare with non-stick spray. Whisk the flour, baking powder, baking soda and salt together in a medium bowl. Combine butter and 3/4 cup sugar in a stand mixer fitted with a paddle attachment. Beat on medium-high speed until light and fluffy, about 3 minutes. Mix in egg, buttermilk, vanilla and 2 teaspoons of the lemon zest on medium speed. Add the flour mixture and mix to combine without over-mixing. Spread batter in the prepared dish (it will be thick). Arrange berries on top of the batter, gently pressing to partially submerge. Sprinkle with 1 tablespoon sugar (if you have turbinado or raw sugar available, that works well on top of the cake). Bake in oven until top is light golden and a knife inserted in the cake comes clean, about 50 minutes. Cool in plate on a rack. Before serving, sprinkle remaining zest over the cake. Serve slightly warm or at room temperature. Accompany with whipped cream if desired. photo by?Katie Roletto?from our days at Love With Food.